Even if you don’t know the name Funny Toheeb you’ve probably seen his photo on Instagram, dressed as a celebrity, but not quite. 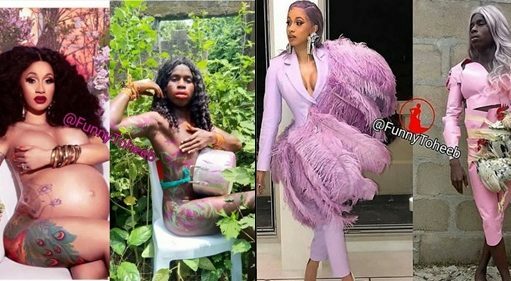 What Toheeb Adedokun Akorede does is, he takes a look by a celebrity, any at all, could be Rita Dominic or 50 Cent, and he recreates it using anything from plastic bottles to noodles to even, believe it or not, groundnuts. He spoke to BBC about his art, saying its aim is to make people laugh and quell depression. He wasn’t born with a silver spoon, he shared, but he wants to be the one to change his family’s story by continuing to think outside the box like his mother taught him.